Hip No. 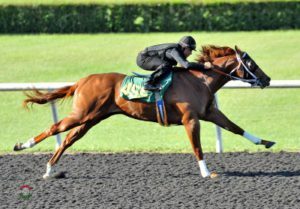 455, a chestnut colt by New Year’s Day consigned by Hawks Nest LLC, Agent, sped a quarter in :20 3/5 to post the fastest work at the distance at the third session of the Under Tack Show for the Ocala Breeders’ Sales Company’s 2018 June Sale of Two Year Olds in Training and Horses of Racing Age. He’s out of stakes placed Awesome Symmetry, by Awesome Again, a daughter of stakes winning OBS graduate Valid Symmetry. Hip No. 457, Yesterday’s Girl, a chestnut filly by Mucho Macho Man consigned by RiceHorse Stable (Brandon & Ali Rice), worked a quarter in : 20 4/5. She’s out of stakes placed Ayers Hall, by Jade Hunter, from the family of champion Estrapade. Six youngsters worked quarters in :21 flat. Hip No. 451, consigned by Scanlon Training & Sales, Agent, is a dark bay or brown filly by Magician (IRE) out of Ava G, by Afternoon Deelites, from the family of graded stakes placed stakes winner Winter Treasure. Hip No. 484, a chestnut colt by Verrazano consigned by Brick City Thoroughbreds, is a half brother to graded stakes placed Motown Lady out of Binavicar, by Vicar. Hip No. 494, a chestnut colt by Speightstown consigned by Tom McCrocklin, Agent, is out of graded stakes winner Blueeyesintherein, by Magna Graduate. Hip No. 561, consigned by Top Line Sales LLC, Agent, is a dark bay or brown filly by First Dude out of Crazysoutherngirl, by Southern Image, a half sister to stakes winner She’s Our Annie. Hip No. 610, a bay filly by Ghostzapper consigned by McKathan Bros., Agent, is out of stakes placed Do Somethin, by Purim. Hip No. 636, consigned by Ocala Stud, is a bay colt by Congrats out of Empress of Gold, by Empire Maker, from the family of grade one stakes winner Air Fore Blue. There were eight eighths in :21 1/5. Hip No. 497, a dark bay or brown colt by Pioneerof the Nile consigned by Wavertree Stables, Inc. (Ciaran Dunne), Agent, is a half brother to graded stakes placed You’re to Blame out of graded stakes placed stakes winner Bon Jovi Girl. Hip No. 528, a dark bay or brown gelding by Corfu consigned by Altamira Stable LLC, Agent, is out of Chandeleur, by Repent, from the family of stakes winner Brite’s High. Hip No. 540, consigned by Hoppel’s Horse & Cattle Co., Inc., Agent, is a bay filly by Violence out of Citron Lady, by Lemon Drop Kid, a half sister to stakes winner Izzy Speaking. Hip No. 556, Giant Mesa, consigned by Winners Circle Thoroughbreds LLC, Agent, is a chestnut colt by Giant Oak out of Corsica, by Sky Mesa, from the family of graded stakes placed stakes winner Lucky Lavender Gal. Hip No. 569, Dakota’s Thirsty, a chestnut colt by Stay Thirsty consigned by Southern Chase Farm, Inc. (Greg & Karen Dodd), Agent, is out of Dakota Sis, by Eddington, a half sister to stakes winner Littlemiss Allison. Hip No. 611, also consigned by Wavertree, is a bay colt by Twirling Candy out of Double Fancy, by Tribal Rule, a full sister to stakes winner Rule by Force. Hip No. 620, a bay colt by Uncle Mo consigned by Tom McCrocklin, Agent, is out of Dublin Four, by Henrythenavigator, a half sister to graded stakes winner Intelligence Cross. Hip No. 622, a gray or roan filly by Concord Point consigned by Doble Jak LLC, is out of Dynamatic, by Dynaformer, from the family of stakes winner Quality Exchange. Two horses tied for the day’s fastest three eighths, timed in: 33 flat. Hip No. 303, Hallucegenic, a gray or roan colt by Winslow Homer consigned by Gayle Woods, is out of Sweet On You, by Candy Ride (ARG), a daughter of graded stakes placed stakes winner New Edition. Hip No. 647, Covergirl Justice, consigned by All Dreams Equine, is a half sister to stakes winner Exciting Justice out of Exciting Avenue, by Avenue of Flags. Two horses shared honors for the session’s fastest eighth, each stopping the timer in :9 4/5. Hip No. 613, a dark bay or brown filly by Exchange Rate consigned by Bobby Dodd, Agent, is out of Downtown Drifter, by Devil His Due, a half sister to graded stakes placed stakes winner Arch Rebel. Hip No. 652, consigned by Eddie Woods, Agent, is a dark bay or brown filly by Munnings out of Extravagance, by Medaglia d’Oro, from the family of grade one stakes winner Bodemeister. There were ten eighths in :10 flat. Hip No. 487, Magic Snake, consigned by Stephen Hope Sales & Co., Agent, is a gray or roan filly by Rattlesnake Bridge out of Black Magic Moon, by Alke, from the family of stakes winner Belle de Soleil. Hip No. 504, a bay filly by Istan consigned by Sugar Hill LLC, Agent, is a half sister to graded stakes winning OBS graduate Motovato out of stakes placed Buffalo Bird Woman, by Slew City Slew. Hip No. 533, consigned by Randy Miles, Agent, is a bay filly by Discreet Cat, a full sister to graded stakes winner Air Khalifa out of Chez La Femme, by Afternoon Deelites. Hip No. 565, a dark bay or brown colt by J P’s Gusto consigned by Victory Stables, is out of stakes placed Cryptocandiac, by Candy Ride (ARG), a half sister to graded stakes winner Workin for Hops. Hip No. 599, Shilah Baby, a gray or roan filly by Graydar consigned by Woodford Thoroughbreds, Agent, is out of Diamond Baby, by Southern Image, a half sister to graded stakes winner Baby J. Hip No. 605, consigned by Weston Thoroughbreds Training & Sales LLC, Agent, is a bay filly by Beau Choix out of D J Trip, by Trippi, a half sister to stakes placed Superstar Bea. Hip No. 618, a bay filly by Fed Biz consigned by Sequel Bloodstock, Agent, is out of Dress Parade, by Victory Gallop, a daughter of graded stakes winner Added Asset. Hip No. 654, consigned by Costanzo Sales, is a bay colt by Uncaptured out of Fabiana’s Flash, by City Zip, a daughter of graded stakes winner Flashy N Smart. Hip No. 674, Shedancesforfate, a full sister to grade one stakes winning OBS graduate Dance With Fate, consigned by Best A Luck Farm LLC, Agent, is a dark bay or brown filly by Two Step Salsa out of Flirting With Fate, by Saint Ballado. Hip No. 675, a dark bay or brown filly by Uncle Mo consigned by Top Line Sales LLC, Agent, is a full sister to stakes placed OBS graduate Mighty Mo out of Flowers Athefinish, by Grand Reward. The Under Tack Show concludes Sunday, June 10th, starting at 7:30 p.m. Hip No’s 676 – 936 are scheduled to breeze.